I've been off this week, and I guess I'm on a "staycation" since I haven't traveled anywhere and just hung out at home. But despite being home, I feel like I've spent as much money and ate as much food as if I were on vacation. And it looks like getting together with friends, especially anywhere near the Mission District's 18th Street corridor, means a visit to Bi-Rite Creamery for some ice cream and then a trip to Tartine Bakery. It's like an annual trip now for me. This time I spotted a girl carrying a plate with this beautiful-looking cake. When I got to the counter, I found out it was a lemon meringue cake (that's right, not a pie) and picked up a piece for myself to take home. 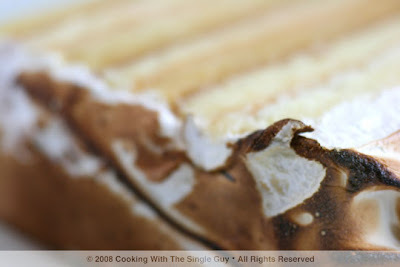 The layered cake was just like eating a meringue pie with the tart and dense lemon cake with layers of curd. But I found my favorite part was the meringue, which is surprising because I generally think of the meringue as a puff of air and tasteless. This was fluffy and subtly sweet and I think I could have just eaten that. So as you can see, I've been eating all the sugar before the new year begins. 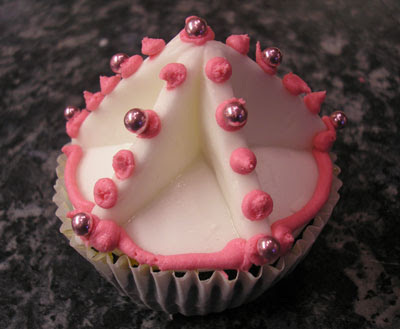 Hope you're all having a great last day of 2008, and here's to more fluffy meringues in 2009! 9. 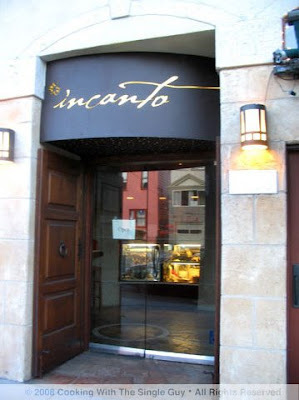 Incanto, San Francisco’s Noe Valley. Rating: 4 stars. This neighborhood restaurant headed by offal man Chris Cosentino offers creative dishes for the adventurous eater. I often think about its spaghettini with shaved tuna heart. Mmmm. 8. Zinnia, San Francisco’s Financial District. Rating: 4 stars. This is a fairly new restaurant to San Francisco’s dining scene, but it has a lot of old roots. One: the chef-owner is Sean O’Brien, who got raves when he was chef of the now defunct Myth. Two: The restaurant is in the old spot of the once popular Scott Howard. I’m sure Zinnia will do well because of O’Brien’s reputation, and always always order the crispy sweetbreads on the menu. 7. Yoshi’s, San Francisco’s Fillmore Jazz Heritage District. Rating: 4.25 stars. Beautiful new dining room with fresh, clean Japanese stylized cuisine. I’m a little sad to hear that Yoshi’s (the original is still in Oakland’s Jack London Square) is struggling in the current economy because it’s such a massive building with a lot of seats to fill. I hope they can ride out this rough time because Chef Shotaro Kamio is really talented. 6. Jack Falstaff, San Francisco’s SOMA district. Rating: 4.25. This restaurant in the PlumpJack Restaurant Group often gets overshadowed by its more well-known older sibling PlumpJack Café. But Chef Jonnatan Leiva is among the rising stars (according to the San Francisco Chronicle) and it’s worth checking out his elegant dishes in a plush dining area. 5. Coi, San Francisco’s North Beach. Rating: 4.25. 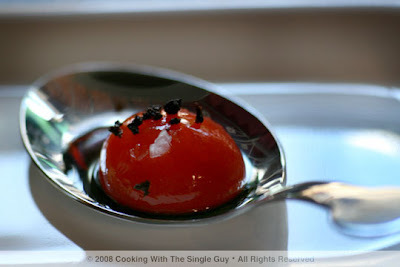 I’ve been very vocal about my feelings about the price of Chef Daniel Patterson’s 11-course tasting menu ($120), especially when you see the portion size of each course. 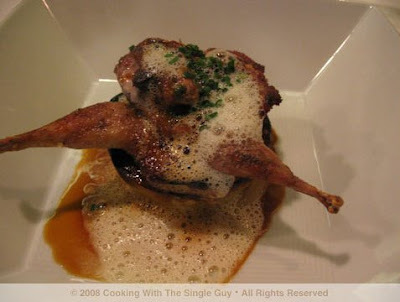 But there’s no doubt that his seasonal and sustainable dishes are creative and some are extremely tasty. I just want more of it! Coi got bumped up to two Michelin stars this year so you know people will continue to come check out this cozy but refined restaurant. 4. Wood Tavern, Oakland’s Rockridge neighborhood. Rating: 4.25 stars. I’m proud to call this my neighborhood restaurant, but it’s more than a neighborhood restaurant, it’s a dining destination. This handsome, charming American brasserie provides perfectly cooked Mediterranean-California cuisine. 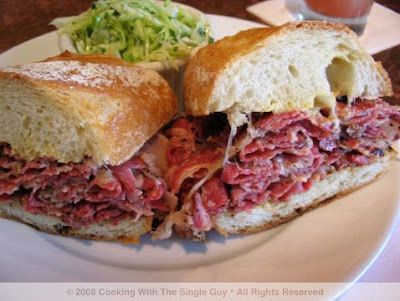 The pastrami sandwich for lunch is always a popular choice. 3. 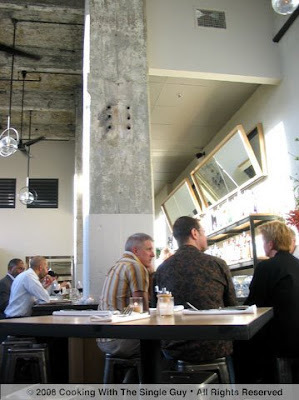 Bar Tartine, San Francisco’s Mission District. Rating: 4.25 stars. One of my favorite restaurants around. 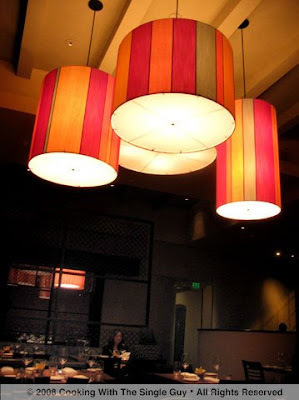 A quaint wooden décor with a beautiful bar for the Single Guy diner and perfectly executed dishes with influences of California, Mediterranean and French styles. 2. Ubuntu, Napa Valley’s Napa City. Rating: 4.5 stars. For a place that can change your minds about eating your vegetables, you have to try the food by Chef Jeremy Fox at Ubuntu, a place that consistently gets rave reviews for good reason. Chef Fox creates dishes that make you forget that you’re missing the meat. 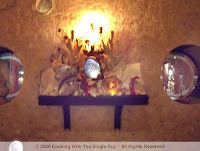 Roasted peppers polenta or white pizza is just so fabulously done and served up in an African-inspired decorated room. And you can take a yoga class too! 1. La Vinera de Bolivar, Buenos Aires’ San Telmo neighborhood. Rating: 4.75 stars. The only restaurant to get the highest rating by me since I’ve started doing this blog two years ago is all the way in Buenos Aires. My eating vacation to this South American city in October was fun, but I wasn’t blown away by the food, which was very similar to San Francisco. That was until my very last meal on my very last day in Buenos Aires when I went to the tiny restaurant of chef Alejandro Digilio, who only serves a 9-course tasting menu. It was creative. It was entertaining. It was tasty. This is the only place where I didn’t really mind eating foam because there was actually a taste to it and a reason for it. My only criticism is that I have to travel more than 5,000 miles to eat here. Ratings are based on a scale of 1 to 5. Jam House or Cruise Ship? In the Bay Area, it seems like a lot of people go out for Christmas dinner because when I tried to get reservations for me and my friend Sue at some of my favorite places, they were nearly booked. So we decided to have a Christmas eve dinner instead, and staying close to home we ended up at Miss Pearl’s Jam House in Oakland’s Jack London Square. Miss Pearl’s Jam House is the once popular San Francisco restaurant at the Phoenix Hotel. And rising like a phoenix, albeit a couple of decades later, Miss Pearl’s is now an elegant restaurant with waterfront view. Opened a few months ago as part of the rejuvenation of Jack London Square, the restaurant is hoping to draw people to the neighborhood with its mix of old world and Caribbean cuisine. While I’ve never been to the original Miss Pearl’s, I’m assuming it does have some resemblance to its old days because its former chef, Joey Altman, was hired as the consulting opening chef for the new Miss Pearl’s. Chef Altman, known mostly for his hosting of “Bay Area Café” on KRON-TV4, has created an eclectic menu of mostly Jamaican-inspired dishes with a few out-of-place choices like Ginger-Hoisin Glazed Salmon. These days, however, I imagine much of the food is influenced by Executive Chef Robert Barker, and Altman returns to Miss Pearl’s on weekends to perform with his band, the Backburner’s Blues Band. When Sue and I arrived at the restaurant, the décor looked more like the Titanic than something called a jam house. The handsome room with a large bar area and open view of the kitchen seemed to emphasize more the sea than the Caribbean. 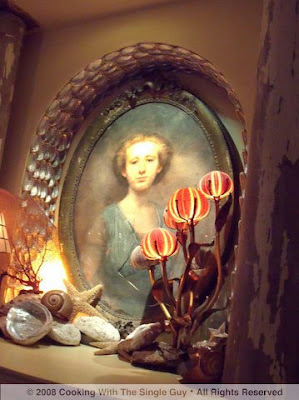 There were sea shell motifs and pastel colors from the coral family. Even the menus are backed by mosaics made of fragments that looked like Mother of Pearl or oyster shells. The only hint of the Caribbean is the attempts to look like an old plantation home with the wooden floors and ceiling. And the food, of course. We started our evening with a special holiday drink called the Winter Solstice made of vodka and a whole lot of holiday spices like cinnamon and nutmeg. It had a citrus-color to it and definitely tasted festive, but I felt it lacked any punch and Sue didn’t like it at all. She swapped her Winter Solstice for a glass of wine instead. When I said the menu is eclectic, I also meant it’s a bit segmented. It can seem overwhelming. It’s broken into small plates, soups and salads, which are all self-explanatory. 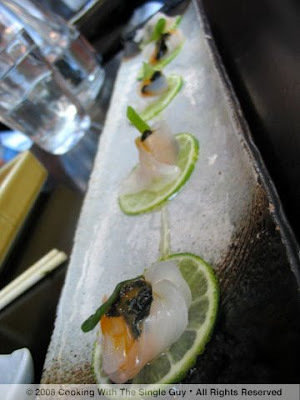 Then you have the “Seafood Raw & Not So Raw Bar,” which is the seafood selection focused on shellfish. 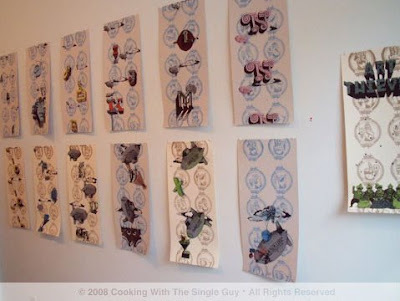 “From the Stove Oven” is a handful of dishes baked in, um, a stove oven. And “From the Jerk Pit” is the Caribbean-marinated meat section that you order ala carte and then add on a choice like Caribbean rice or fried plantains from the sides section. 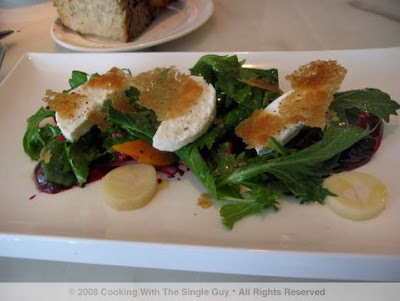 Sue and I started by splitting the Mixed Greens with Roasted Spice Pears Salad ($9). 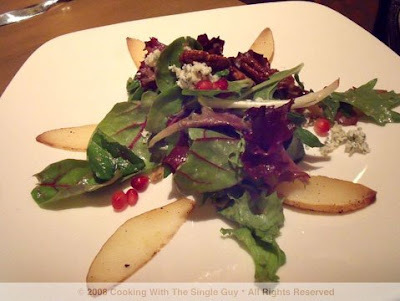 Our waiter kindly served the salad in separate plates (so the serving size in the photo is half the normal size) and it was a pleasant California-style salad with the classic combination of blue cheese and pears all held together with a sherry vinaigrette. It looked more festive with the sprinkling of pomegranate seeds. For her dinner, Sue got a couple of small dishes. 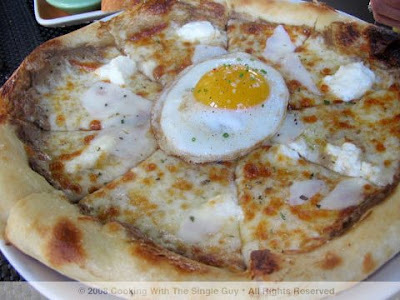 The first was from the stove oven, the Cheesy Dungeness Crab Flatbread ($11), which looks a lot like a thin crust pizza. Sue says she liked the crab flatbread. 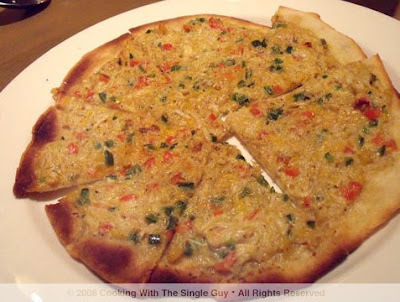 The fresh crab meat was spread thinly over the flatbread, mixed with a few bits of spicy peppers. I thought the topping itself was average in flavor and the flatbread a bit chewy. 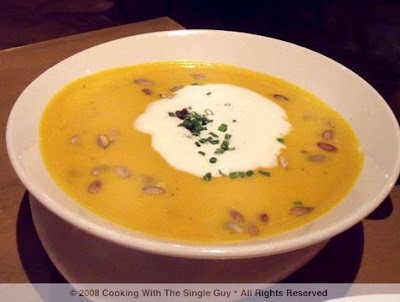 Sue also got the special soup, a Butternut Squash Bisque ($8) that was actually a big bowl for the money. It was spiced with a chestnut-apple-tamarind salsa that had settled to the bottom of the soup, so Sue learned that it’s important to always stir your soup before jumping in and eating. 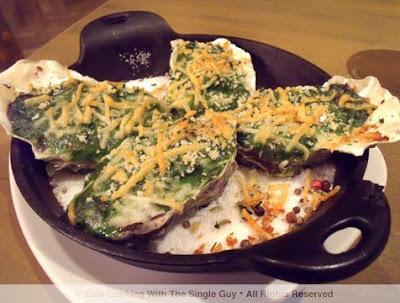 I also ordered something from the stone oven, getting the Oysters with Tasso & Spinach ($13). This was basically like baked oysters in a sauce topped with cheese. I didn’t know if it was the tasso or the spinach, but the oyster was swimming in a thick green sauce that was almost like pea soup. But for some reason the green color looked really fake. It tasted bland and the oysters didn’t seem very plump. For my entrée, I ordered half a Petaluma Chicken ($13) from the Jerk pit with a side of the market vegetables, which that night was roasted baby carrots. The chicken looked like a nice size serving and the meat was incredibly tender. It was fork tender pulling easily away from the bone. 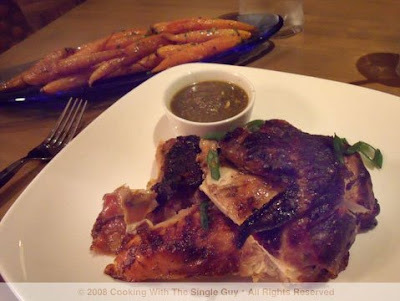 The jerk spices associated with Jamaica were very good, but stuck primarily on the skin. And since I don’t usually eat the skin, I don’t feel like I got the true jerk flavoring, despite the fact that the waiter says the chicken is marinated in the jerk spices for 10 hours. Still, I felt the jerk chicken was my favorite dish of the night because it really was so tender. While dinner was a mix bag of pleasant-to-good dishes, I felt dessert, surprisingly, really picked up the evening. 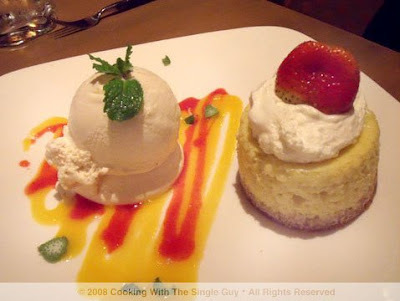 I ordered the Tres Leche Cake with passion fruit and strawberry sauce ($8). 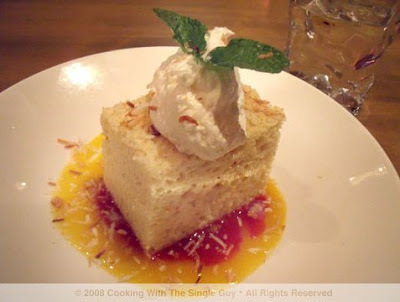 I don’t think I’ve ever had a tres leche cake, although I’ve always liked the name. 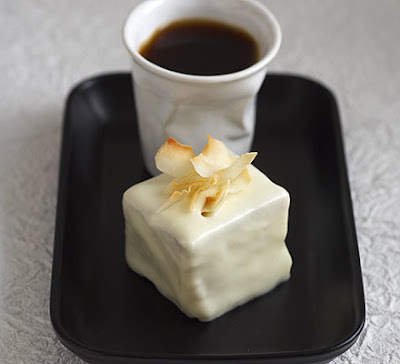 But this particular cake was like a vanilla-coconut cake that was quite enjoyable and really enjoyable when you dredged it through the generous passion fruit sauce. I have to say, though, that I really wanted to steal Sue’s dessert, which was the Key Lime “Bi” pie and sorbet ($8). I looooved the strong lime flavor of the tiny key lime pie (it was more like a piece of cake), a real balance of tart and sweet. 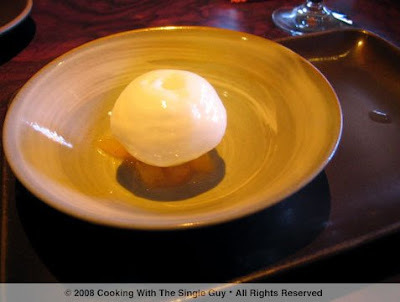 The sorbet was served on top of a meringue cookie. Side note: While the reception staff seemed a bit disoriented on this holiday evening, our waiter was extremely professional and engaging. He was very thorough in his description of the food, making them all sound really good to eat. Miss Pearl’s Jam House seems like the perfect place for weekend brunch when the sun is out and you can enjoy the beautiful view of the bay. But the food isn’t distinctive enough, I feel, to maintain a steady night-time crowd who has to travel all the way down Broadway to Jack London Square. If Chef Barker focuses more on the Jerk pit offerings, becoming more a pit house than a jam house, then I think this new restaurant might be a winner. The seafood and other offerings just make it seem more like a cruise ship, when really I think Jamaican BBQ is more suited for a place called Miss Pearl’s Jam House. 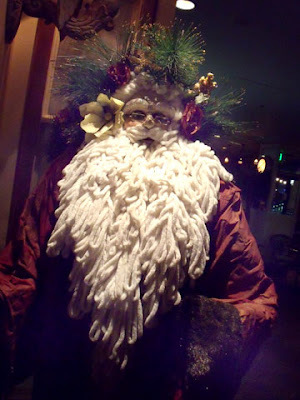 OK, I admit that I’ve been very Scrooge-like this holiday season. I’m just not into it. I’m not feeling it. I just have to get it out. BAH HUMBUG. Whew. There. I feel better now. My low-key holiday means I really haven’t been cooking anything special for Christmas. 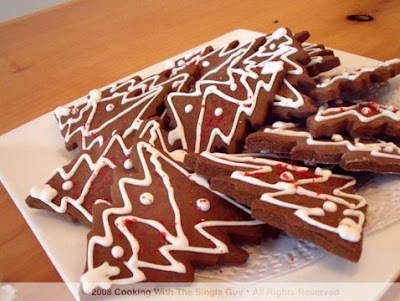 Other than the chocolate-making with April, I just haven’t been creating any snowflake-like cookies or yule log cakes. But that doesn’t mean everyone else out there hasn’t. So I scoured the Web for some creative, fun holiday treats being made by more festive food bloggers out there, and this is just a few of what I found. Now cupcakes can always put me in the mood, and apparently cupcakes are the perfect canvas for beautiful Christmas creations like this ornament-like cupcake I found on the Cupcake Recipe blog. 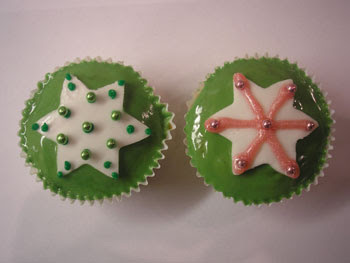 … and this beautiful pair of star cupcakes. I love the color combo. 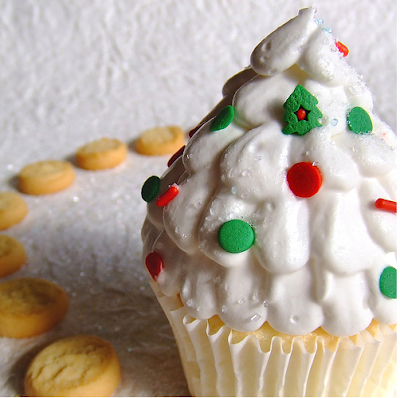 This is my favorite Christmas cupcake that I found on a blog called Banana Granola. 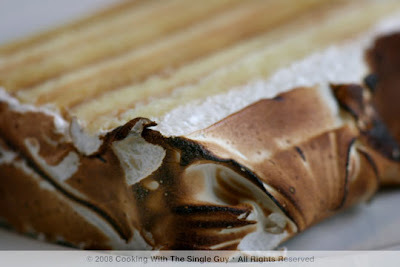 This is just a beautiful looking dessert I found on the BBC food blog. Doesn’t it look divine? 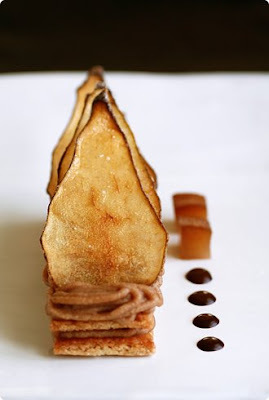 Another pretty looking dessert with a winter theme is this mont blanc poached pear creation that I found on this interesting British food blog. Gingerbread men are always a joyous sight in the kitchen I think during this time of year. 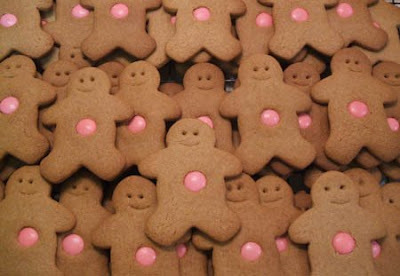 These gingerbread men look like they have pink aliens coming out of their stomachs. Aloha! 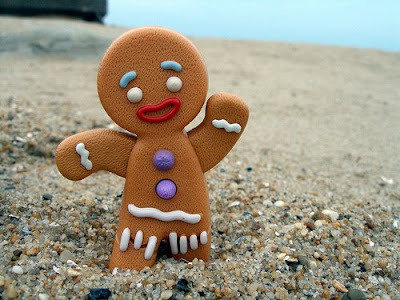 Here’s a gingerbread that I can relate to since this is the kind of Christmas I had growing up in Hawaii … Christmas at the beach! 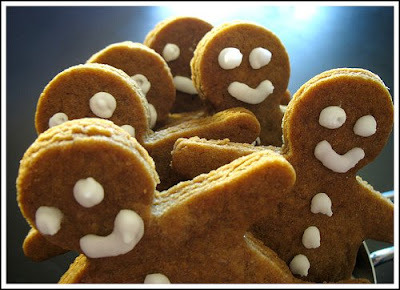 I found this plate of gingerbread men from a blog called 300 Million. 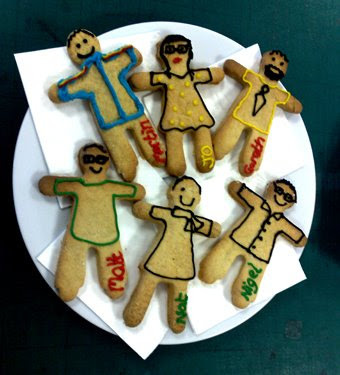 I really don’t know what the blog is all about, but I thought it was cute how they made gingerbread men for each of their team members. 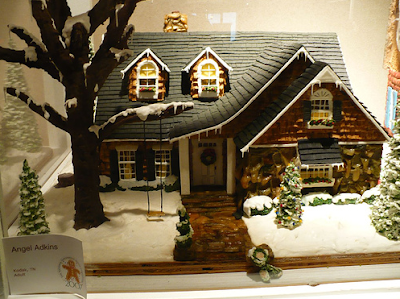 Speaking of gingerbread, you can always count on some amazing gingerbread homes, like this one that apparently won a national gingerbread contest back in 2007. The Japanese are always creative with their food. 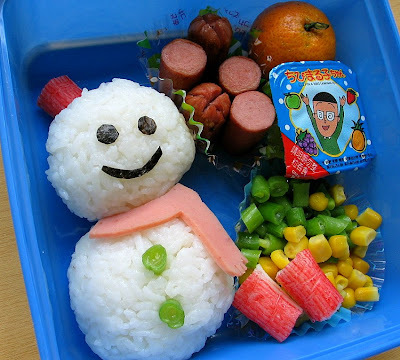 Here’s a packed lunch with a snowman made of rice. It’s more like a snow-musubi. And finally, here’s one of the most amazing creations I found out there. It’s actually done by a professional cake decorator (no wonder). I would buy from her. She’s called Cutting Edge Designs in Colorado. Isn’t it amazing? 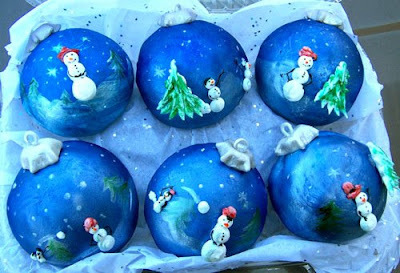 They’re Christmas ornaments made of cake. Happy Hanukkah to all my Jewish friends out there! Tonight is the second night of Hanukkah and my friend David and his wife, Ann, invited me to their Hanukkah party. 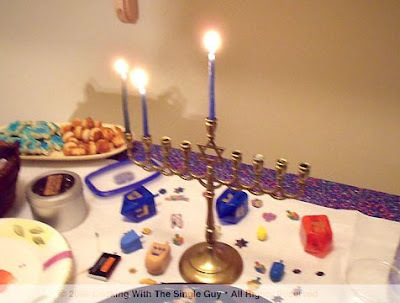 It's hard to believe, but this is my first Hanukkah party, so I was interested to see what's served. The first thing that caught my eyes were these cookies. I don't know if they're traditional or not, but they're definitely Jewish. 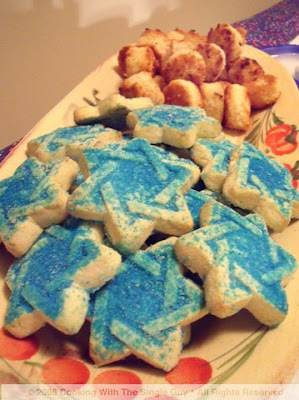 I mean, they have the star of David and they're blue, which seems to be the Jewish color of choice for the holidays. I'm wondering if the blue has something to do with the Jewish flag? Behind the cookies are macaroons, which were nice bite sizes. And yes, these were the coconut version. David got these from Grand Bakery in Oakland's Grand Lake neighborhood. It's a really kosher bakery. There's been a few times I've wanted to check out this bakery but it was often closed to observe the Sabbath. I don't think I would make a good Jew because I'm constantly thinking of eating on the Sabbath. Oy-veh! 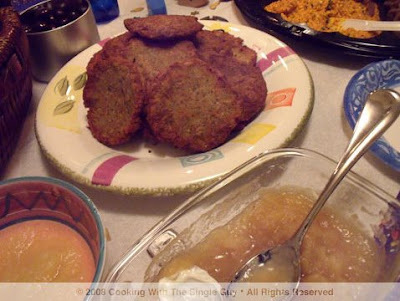 Now this is definitely something associated with Hanukkah and Jewish food, and that's the latkes. I have to say, I was disappointed that David didn't make this himself because he's made them before for my blog so I was expecting them to be from scratch. 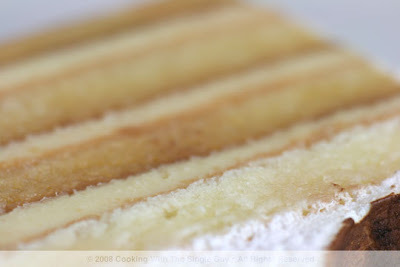 Instead, he got these also from Grand Bakery. They were OK, I'm sure the homemade version would have been better. But don't you think they kind of look like veggie patties? Oh, that's apple sauce that's traditionally served with them. Oooh, now these are the kind of holiday food I can get into. 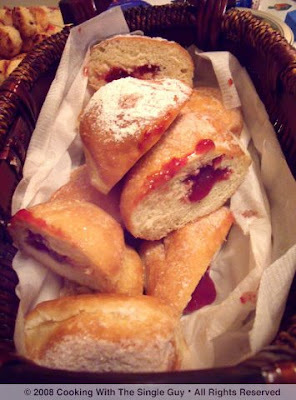 They're sufganiot, which is a kind of jelly doughnut. (BTW, none of the Jews at the party could spell the name for this doughnut.) For Hanukkah, a lot of fried food is served because the story goes that the Maccabees who liberated the country didn't have enough oil to light the candles in the temple, but the miracle is that the limited oil was enough to last eight nights instead of just one. (I learned this story from "Friends.") Anywho, so a lot of food made with oil like deep-fried doughnuts are served. Some also believe the sweetness of the jelly inside represent the sweetness of life after years of suffering. Along with the food, there were also some dreidel spinning. But actually a lot of the kids at the party were babies because David and Ann also have a newborn. So most of the dreidel spinning were done by the dads. 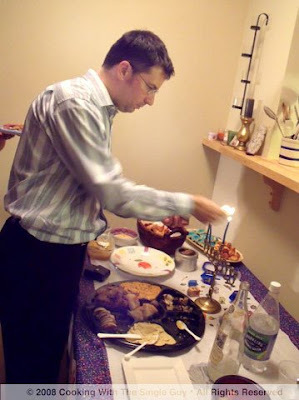 Above, David lights his menorah. It was an interesting night to learn about a different side of this holiday season. And of course, it's always fun to get together with good friends, old and new. 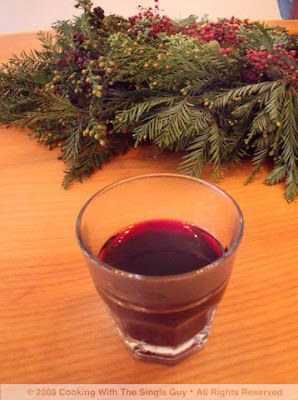 I came in from the rain today and warmed myself up with some mulled wine, courtesy of 18 Reasons, a tiny community space in San Francisco's Mission District. 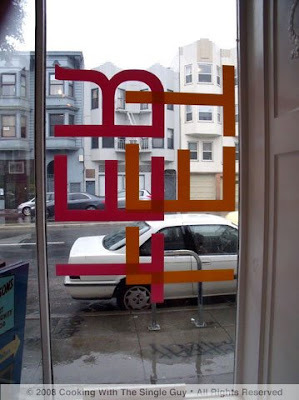 18 Reasons was started by the founder of Bi-Rite Market, which is just a few steps down 18th Street. (18 Reasons is on Guerrero at 18th Street). The idea is that it would be a space for the community to get together and enjoy art and food. I came to enjoy the mulled wine and holiday cookies from Bi-Rite. This was my first time visiting the space, and it was a very intimate group. Partly because of holiday shopping and the rain, there wasn't a very large crowd. Still, it was nice just to drop in and enjoy some holiday cheer. The space showcases local art, but it's not really a gallery. It's more a space for special food events, and supposedly the wine dinners are a big thing. If you want to learn more about future events, you can check out their Web site here. 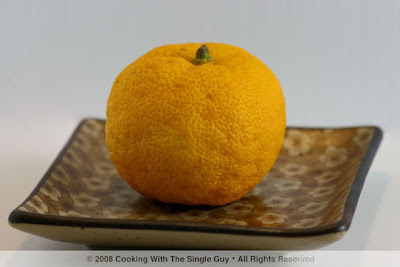 One of the most common ingredient I see on restaurant menus in the Bay Area is yuzu, the Japanese citrus. It just sounds so exotic, huh? But I never met the yuzu, until last weekend at the farmers market at the San Francisco Ferry Plaza. Since we’re entering citrus season, there are more interesting lemons, oranges and such at the markets. I picked them up at my favorite place for fruits, The Hamada Farms from Central Valley. 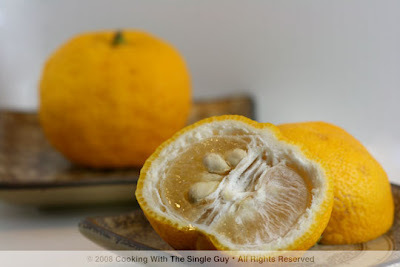 The yuzu looked a lot like a tangerine, and when I cut into them at home I was right. It has sections like a tangerine and the peel came off easily like the crinkly orange-colored tangerine pith. 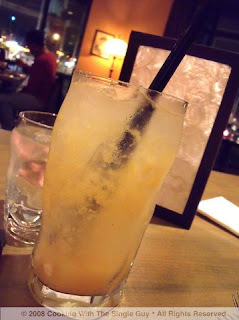 But the fragrance was the most interesting part about the yuzu. It’s a little like a Meyer lemon with the scent of sweet lemons and tangerines combined. The juice itself, however, is really sour, more so than limes. The Japanese often blend the juice with soy sauce. Since this is the first time I was using it, I figured I’ll do the same and just poured it over a fresh red snapper that I got from an Asian grocery store in San Francisco. 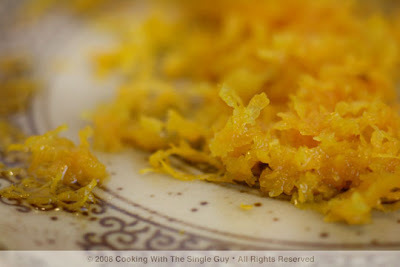 I made sure to use the zest of the yuzu because I really do like the fragrance of it more than the juice. If you spot them at the markets (they are still pretty rare to find), give them a try. Enjoy!